Squash are classified into two groups—summer squash and winter squash. In Georgia, summer squash are harvested May through October, while winter squash are harvested August through December. Summer squash grows on non-vining bushes. Winter squash matures on the vine and its hard rind helps with winter storage. 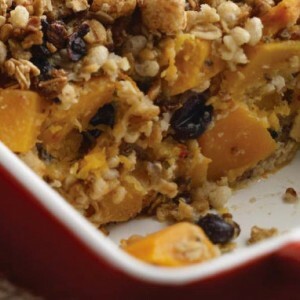 Both types are high in fiber, vitamins A and C. This recipe features butternut, a winter squash. Serves six—these are 1/2 cup servings. In a large bowl, toss squash in 1 teaspoon olive oil. Spread onto a large baking sheet sprayed with non-stick cooking spray. Roast in oven at 350 degrees for 30 minutes or until tender and lightly brown around the edges. Remove and keep warm. In a small bowl, toss onions, jalapeno peppers and red peppers with remaining olive oil. Spread vegetables evenly onto a backing sheet sprayed with a non-stick cooking spray and roast in oven at 350 degrees for 15 minutes or until tender and lightly brown around the edges. Check the vegetables often—they will brown very quickly. Remove and keep warm. Rinse quinoa in a fine mesh strainer until water runs clear, not cloudy. Combine quinoa and 1/2 cup water in a small pot. Cover and bring to a boil. Turn heat down to low and simmer until water is completely absorbed, about 10 to 15 minutes. When done, quinoa will be soft and a white ring will pop out of the kernel. The white ring will appear only when it is fully cooked. Fluff with a fork. Set aside. A rice cooker may be used with the same quantity of quinoa and water. In a large bowl, combine squash, black beans, quinoa and oregano. Mix in applesauce, salt and optional fresh lime juice. Add onions, jalapeno peppers and red peppers. Pour mixture into an 8-inch by 8-inch, non-stick baking pan. Press gently to pack. Sprinkle granola evenly over the top of mixture. Bake for 30 minutes at 350 degrees. Granola should be lightly browned. Serve hot. Posted in Recipes. This entry was tagged diet, health, healthy, nutrition, recipe, recipes, squash. Bookmark the permalink.